A Year of Being Here: Yehuda Amichai: "The Place Where We Are Right"
"The Place Where We Are Right" by Yehuda Amichai, from The Selected Poetry of Yehuda Amichai, edited and translated from the Hebrew by Chana Bloch and Stephen Mitchell. © University of California Press, 1996. Image credits: Author photograph: © Dan Porges. 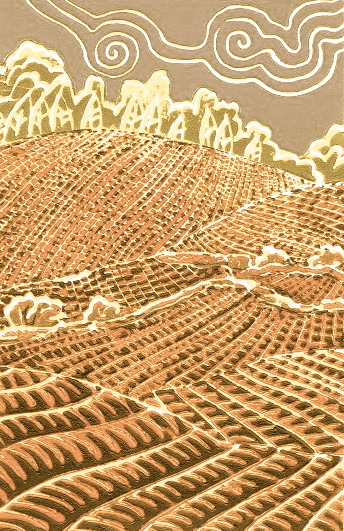 Artwork: "Plowed Fields 1," reduction linocut, by Dave Leeper (originally color). Thanks for this. I'm hoping it'll hold me for more than a day. I hope so, too, David. Much more than a day.